I’ve been a student at Leeds for almost three weeks now. As an exchange student I am keen on keeping a lot of stuff that will remind me of my study abroad excursions for years to come. Thankfully, I have a cushioned pin board in my dorm room that I’m currently tacking things onto. However, I wonder about the multitude of ways I can display these memories and generally the odd stuff I’ll keep over the course of the semester. Be it ticket stubs, receipts, maps, or postcards, I’m excited to showcase or preserve them when I go home to Chicago. Here are a handful of ideas (from most visible to more private) I’ve tried myself and a couple I’m eager to try! The summer before I moved into my dorm at my home university, I gathered a bunch of concert memorabilia surrounding my not-so-subtle love for One Direction and a photograph of my meet and greet with Niall Horan that summer. I pinned everything into the fabric backing of a mid-sized shadow box. It’s a great reminder of your admiration for something and instantly transports you back to those happy times. In addition to fixing up my shadow box, I’ve been hoarding movie tickets for years (let’s just say, the oldest one I have is the Hannah Montana movie from 2009—ouch). Every time I see one, I keep the stub and layer it meticulously in front of something already on my pin board. Eventually, I figured out I could use these old science classroom jars as containers for my stubs. You can really put anything in jars—especially glass—like sand and seashells, charms, rocks, receipts, tags, flowers, and coins. I have yet to try this, but I know this is a popular way of sharing photos, but why not make one strictly from your adventures? My uncle and aunt used to send us one along with all the family birthdays and important anniversaries. If you’d rather go a simpler route, gather all your scenic and architectural photos as aesthetic reminders. Try to organize the photos so the months correspond to when you visited! Shutterfly, Photobox and Motif are good places to start. You can choose from small desk calendars, hanging wall calendars, and more! Although this may be the simplest and most discreet version of keeping your souvenirs, you can have fun with the outsides! 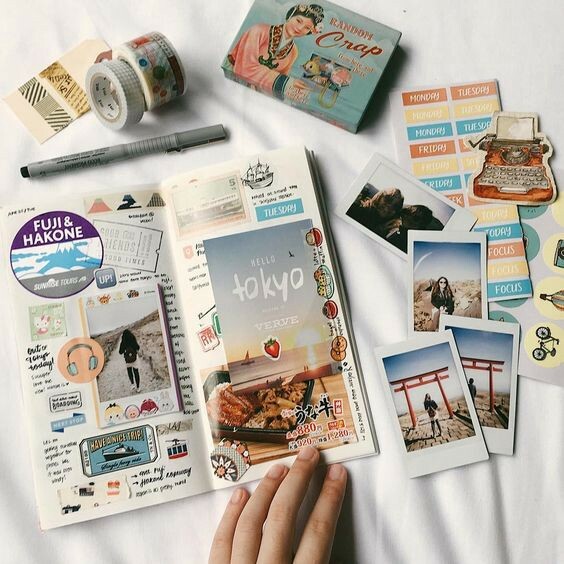 You can decorate it with scrapbook paper or decoupage papers/postcards you collected on your trips. On the other hand, you can simply label it with the name of place you visited or what kind of trip it was: The Cousins in Italy, Spring Break 2019, etc. Have fun with the colors, patterns and even the way you organize the contents! In preparation for my travels while I’m abroad, I purchased a journal that is a third ruled paper, a third dotted, and a third blank. It really gives me freedom to organize and write as I please, in addition to a pocket in the back for little pieces I can later tape or glue inside. With these pieces, don’t be afraid to use stickers to keep things in place. For instance, I just taped down three of my London tube tickets with stickers that had trains, maps, and small phrases on them related to travel. Although journals are usually meant to be private, you can design it in such a way that the pages act as artwork, describing your journey. If you’re like me, doodle a bit of imagery like food, buildings, or scenery to give it some style. Show off your hard work when it’s full and decorated with all your memorabilia!